BBB was alright, they had a good selection and weren’t terribly expensive but it felt more like a date spot than an actual craft beer bar. The seats for lonely loners are all directly in front of the door which really made me feel like they just wanted us out of there as quickly as possible so they could concentrate on their tabled guests who are having proper meals. So it’s fine for a meal with craft beer, but if craft beer is all you’re after (and we were), there are MUCH better places to go in Shimbashi. The second bar we went to on our Winter Wonderland Shimbashi Beer Crawl (well, technically third, but the second bar had about seven seats and wanted to keep their one table for regulars instead of three lumbering randos), Brasserie Beer Boulevard (Boulevard Beer Brasserie? whatever) is more what we’ve come to expect from Japanese craft beer bars: lots of wood and cast iron decor, and skillet-based food offerings. We shuffled in from the cold and were placed at the standing-area table directly in front of the door. Oh well. Considering the small size of the bar, an inordinate amount of space is taken up by semi-private booths, with only three tables (seating ten) for people who aren’t agoraphobic, eight counter seats and the aforementioned standing perch which we were huddled around. There’s also a terrace somewhere, but I couldn’t see it. All in all, it’s not really convivial. Quite a contrast to Brew La La, Brasserie Beer Boulevard is definitely more of a sit-down and shut-up type establishment. And yes, it is non-smoking. 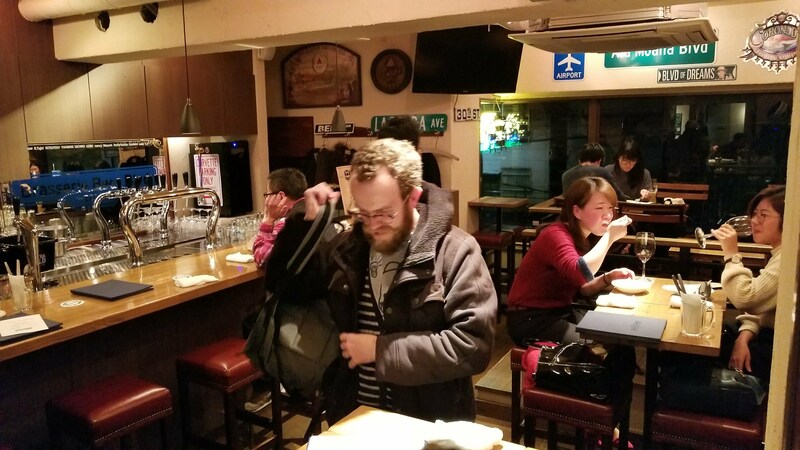 The beers are a mix of domestic and US craft beer, with the prices ranging around 750yen/1000yen for a US half/pint of domestic, to 850/1200 for an import. There is a dreaded table charge of 300yen too. They got Rob’s order wrong (understandable) but gave him the wrongly-poured beer for free which was nice and made Rob go on about me being jealous over it for the rest of the evening which was totally not true I don’t even care and don’t even like white ales ROB (It was more like 2 mins but Joe does have a skill in exaggerating things. -Rob). There is a party plan (predictably, considering the abundance of private rooms in this place), which come in two flavours: A, for 5000yen, and B for 6000yen. The craft beer options for them are somewhat underwhelming, though- Option A only gives you Far East Blond, and B gives you Far East White and IPA. Stingy. The food, as I mentioned, is largely skillet-based. Of course! what better place to carry around burning-hot iron pans than a crowded bar full of drunk people. Paella for two for 1556yen, a rump steak for 1760yen, it all looked good, and the barometer order of chips was predictably high quality. I would have liked a steak but we were basically leaning on a table next to the door and eating steak standing up just feels wrong. 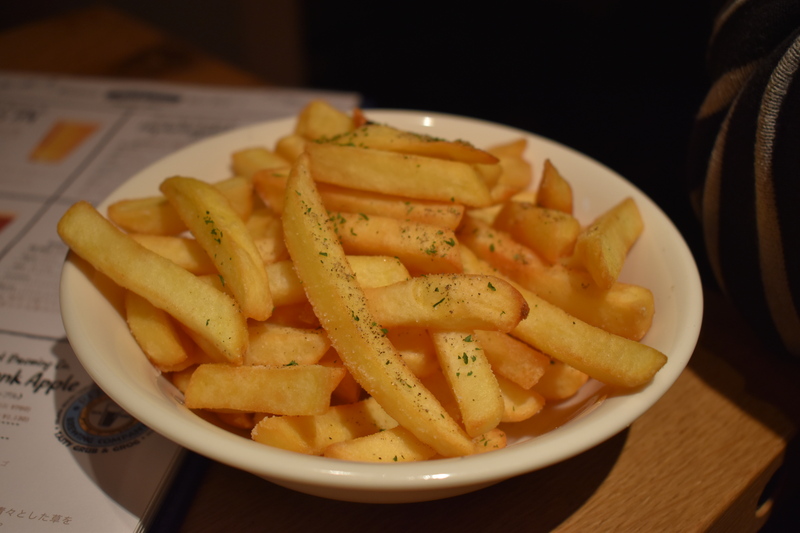 Brasserie Beer Boulevard is located between Shimbashi station on the JR Yamanote, Keihin Tohoku, Tokaido, and Yamanote line, and Onarimon on the Toei Mita Line, as well as Tokyo Metro Ginza and Toei Asakusa.